If you are looking for a laser hair removal system for your business, a professional refurbished machine may provide you with a good investment. 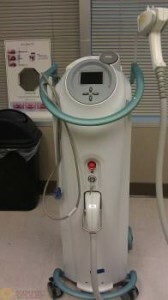 One of the most effective and affordable hair removal machines is the Syneron Comet Laser System. Owning a Syneron Comet Laser System is an asset that offers many benefits. Not only is the machine a safe, easy, convenient and valuable hair removal system, but it also has the unique capabilities of working on all skin types and hair colors. With a refurbished Syneron Comet Laser System you are likely to have a machine, which provides superior results and performance compared to some similar kinds of laser hair removal systems. Having a quality used Syneron Comet Laser System for your cosmetic business is a cost-effective and productive investment. This brand and type of used laser system is reliable and easy to operate and service. With the superior performance your clients are likely to experience safe, comfortable treatment as well as successful results. The system also has the advantage, over other varieties of laser removal machines, of treating all types of hair colors and every kind of skin type and complexion. For questions and pricing on the Syneron Comet Laser System you may contact our customer service team and we’d be glad to assist you with your purchase!